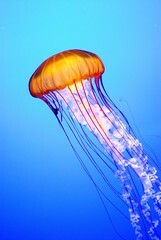 “Quite a number of people have the abiding impression that the church’s faith is like a jellyfish: no one can get a grip on it and it has no firm center,” Joseph Cardinal Ratzinger, In the Beginning, p. 7. For how many of us is our faith like this idea of Catholicism? Pretty to look at, nice to be able to point out to our friends, but nothing with substance that can cause us to have to reform our lives? Are we like the jellyfish? Swimming without eyes in the great ocean of life? No vision, but just reacting according to our instincts and desires as sensations come our way? No direction, no community, each jellyfish out for whatever nourishment he or she can obtain from those weaker than him or herself?